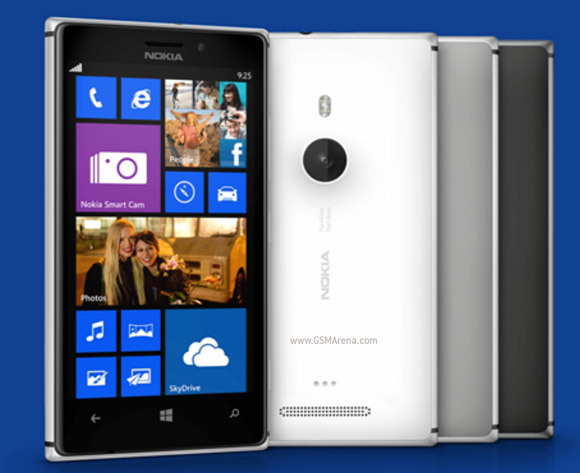 Nokia just announced its third phone in five days, its new WP8 flagship called Nokia Lumia 925. It's similar to the Lumia 920 and Verizon's Lumia 928 in that it packs an 8.7MP sensor with Optical Image Stabilization and f/2.0 aperture. The flash is a regular LED flash, no xenon here. The screen is 4.5" in diagonal and has WXGA resolution – that's 768 x 1280. More importantly it's an AMOLED with ClearBlack and Gorilla Glass 2, instead of an LCD. Unsurprisingly, the Qualcomm chipset of the Lumia 925 packs a dual-core Krait processor at 1.5GHz with 1GB of RAM, which is the best that WP8 currently supports. The phone has an aluminum frame around the side, while the back is polycarbonate. The body is just 8.8mm thick and weighs 139g - much more acceptable than the Lumia 920. Inside it is a 2,000mAh battery, same as the Lumia 920 and Lumia 928. The battery is non-removable and there's no wireless charging out of the box - you can enable that with a thin charging cover. The built-in storage is 16GB (a downgrade from the 920 and 928) and there's no microSD card slot to expand it. Actually, the Vodafone version of the phone will pack 32GB of storage, which is better. The Nokia Lumia 925 will be available in Europe (Vodafone Germany, Italy, Spain and UK, where it will also be carried by O2) and China (China Mobile and China Unicom) this June for €470 ($610) and will come to the US later on T-Mobile. Why nokia close/stop Symbian OS. I don't like lumia and android. same clothes with extra blink blink..